The Polar FT7 Heart Rate Monitor is a tool that helps people of all activity levels record their progress toward weight loss and fitness. The monitor comes with a heart rate sensor to be worn around the chest that fits comfortably and snugly. The heart sensor transmits information to the backlit watch that contains the training computer, which shows the data that is sent from the heart sensor. The training computer displays information about heart rate, calories burned, fat burning and cardiovascular fitness zones, and the time of day. 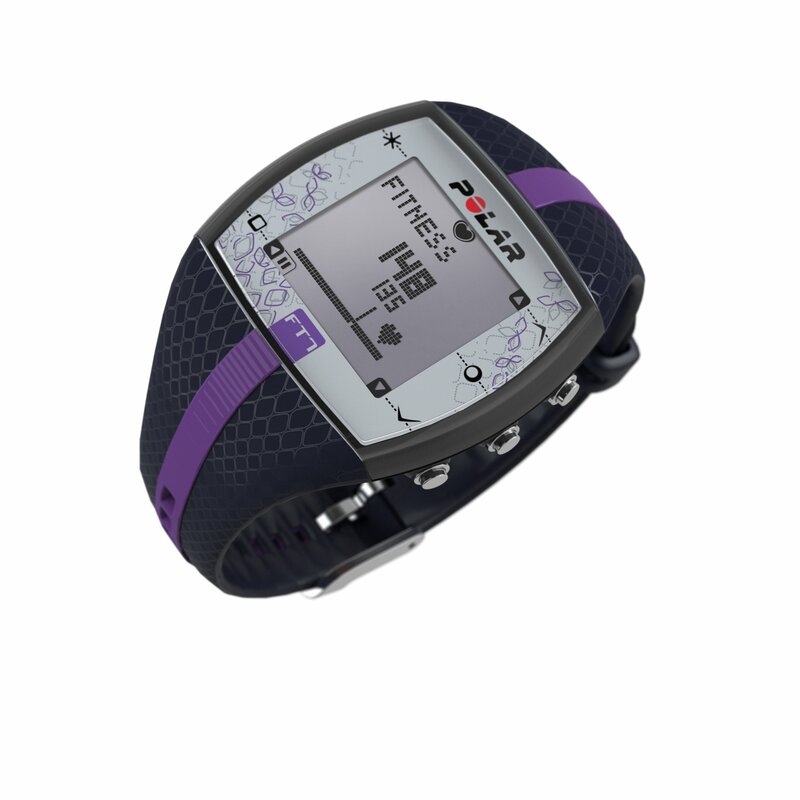 Alarm and stopwatch functions are also included on the watch to help track workouts. The watch sells on Amazon.com for around $70, depending on color. With the additional purchase of FlowLink, a wireless transmitter, the user can easily transmit the data from their training computer to polarpersonaltrainer.com to track and review their personal data. The Polar FT7 heart rate monitor watch is user friendly and a sophisticated way to measure data during workouts to help you reach your fitness goals. The chest strap and watch have adjustable bands to fit comfortably and snugly to remain in place and worry-free while you exercise. The Polar user manual includes detailed step by step directions with illustrated examples that allow you to quickly and easily get started. Since the Polar FT7 tracks all of your workout data and stores it in the training computer, you can access information about your stored workouts at any time. You can also compare workout data over time to note improvements in fitness level and assess progress and areas still in need of improvement. With a replaceable battery and an easy-to-open back panel, the Polar FT7 has a long lifespan and is functional in a variety of workout environments. The sensor, chest strap, and watch are all water resistant, allowing you to utilize the technology without worrying about rain, sweat or drips from your water bottle. The heart rate monitor is also safe to be used underwater and records your workout data accurately while swimming or engaging in water sports close to the surface of the water. The heart rate monitor is also easy to keep clean. After each workout, the heart sensor transmitter can be removed from the chest strap, and the strap can be rinsed in warm water and air-dried. The watch can easily be cleaned using warm water and a mild soap. This heart rate monitor also records data accurately and easily. The calorie count function on the training computer is more accurate than gym equipment and most fitness apps, as it considers all of your personal data as well as your workout data in calculating your expenditure. As you lose weight or need to adjust your age, the settings within the training computer are easy to change to help you keep accurate data. The training computer also provides weekly workout summaries, detailing the number of workouts, the amount of time spent exercising, and the number of calories burned that week. One of the more difficult aspects of the Polar FT7 is adhering the chest strap so that the sensor can measure heart rate accurately. It is recommended that the chest strap be wet slightly before applying to ensure that it sticks to the skin and remains in place. The heart rate sensor will also have difficulty transmitting data in heavily chlorinated pools, as well as in the ocean. The watch itself can also be difficult to operate easily during a workout. The buttons are very stiff, and at times it can be difficult to select the function needed. It is also important to stand a distance away from others while initializing the heart rate sensor and training computer prior to a workout to ensure they sync properly. Finally, there is no way to sync data from the training computer to a smartphone, or to the computer without purchasing the FlowLink. This can be frustrating for those who want to keep and view their data outside of the training computer, and do not want to spend the extra money to do so. Overall, the Polar FT7 heart rate monitor watch is a great fitness tool for those interested in monitoring and learning from their workouts. While some of the features, such as the watch buttons and adhering the chest strap, can be difficult to adjust to and figure out, the overall capabilities of the heart rate monitor are well worth the purchase. For the reasonable price point, the FT7 heart monitor offers personalized fitness data collection and analyses that are accurate and are recorded for future assessment and reflection. The waterproof design allows the heart rate monitor to be used for a variety of sports and activities easily and effectively. When compared to other heart rate monitors with similar features or in the same price range, the Polar FT7 is the smart buy.